For the 2018 Layout and Marking Tool Swap, I tried my hand at a colonial style chalk line reel. These chalk lines were used in the 18th century to snap straight lines along timbers being shaped for cabins and ship-building. The head of the reels spins on the handle, allowing it to be quickly deployed. I also added a small round container to hold chalk dust as an accessory. My rough prototype version was made completely from green wood cut from a maple in our back yard. I shaped it with a pocket knife, and just bent it by hand. The final version is a mixture of green and dried wood. The bow, this time, was steam bent, and thinned along the entire length. I don’t have a lathe, so the handle and chalk container were slimmed down with a pocket knife then smoothed with sand paper. Nice job, Elroy! I wouldn’t have thought of a chalk-line but that just shows my brain sometimes doesn’t work all that well. Nice rustic chalk lines. The spalted maple is a nice touch. I thought your chalk line was the most unique item in the swap. Even if you hadn’t told us that it was a reproduction of a colonial chalk line that would have instantly been my first guess. It looks exactly like something from that period should be; minimal, functional, but with an understated simple elegance. Making it with hand tools only seems natural as well. Your projects are always something I look forward to studying because one look isn’t enough. There is a lot to learn from them. Nice and unique tool from the 18th century. I wonder what they used for chalk, and how they applied it. With the string all exposed on the spindle, I suppose the marking material could just be sprinkled it before use, and maybe fire ashes were used as the chalk. Interesting to ponder, those old timers were pretty resourceful. Wow Elroy great job – pocket knife? I’d be short fingers after trying to execute this. You do the coolest stuff! With the simplest tools. I never thought chalk lines were used in those days, this says they were. Very nice! Superb Elroy! Thanks for bringing some history and making it fun and useful. An excellent entry for a swap! 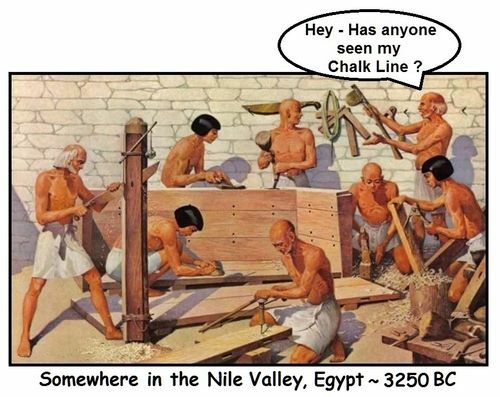 chalk lines were used in the building of the Egyptian Pyramids 5,000 years ago. not much as changed about the tool or technique throughout the ages of time. in a tool box that I am assembling for tools that my fore-fathers used back in their day. Thank You Elroy for taking your time to share your skill and knowledge of the 18th Century. I enjoy seeing recreations of primitive tools, nice work.